GSU Racial Slur: Is Spell Checker the One to Blame? Turns out, spell check can play a VERY bad joke on you. Or is spell check the one to blame? As reported by BuzzFeedNews, a text message sent by a student at Georgia Southern University has become a reason for serious racial slur. The Typical Student team learned the details. The screenshots of a conversation between two GSU students, soon-to-be roommates, literally broke the internet. Allegedly, a white student sent a racial slur to a black student, her soon-to-be roommate. 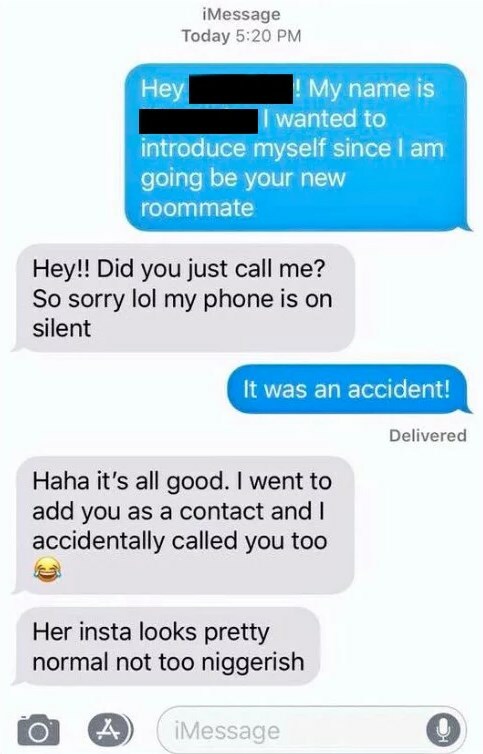 In the screenshots, a black female student is texting a hello to her new roommate, who is white. The white student replied as follows: "Her insta looks pretty normal not too niggerish," which looks very much like a racist comment to a friend about the her soon-to-be roommate’s Instagram. Right after she noticed the mistake, she started blaming her phone's spell checker function for the slur. She attempted to apologize saying: "Damn spell check I did NOT mean to say that. I was texting Hannah and I meant to say triggerish meaning that you seemed really cool nothing that triggered a red flag!" However, later on the woman who texted the racial slur deleted her social media profiles. It is yet unknown whether Georgia Southern has taken any disciplinary action against the student who “authored” the slur. Allegedly, for black students at GSU this is not a surprise.